The immersive spatial installation Haptic Field (v2.0) is a multisensory experience in which touch, sight and listening fuse into a holistic experience. First, the visitors dress in overalls specially designed by JNBY, whose semi-transparent hoods obscure their view, while integrated sensors and vibrating actuators convey intense sensory impressions; a hallucinatory and dreamlike environment is created, in which everything is in motion. The participants are guided through the rooms by the moving vibrations pulsing through the clothes as well as shimmering light and darkness. The visitors’ fixation on the sense of sight becomes secondary — space begins to dissolve and their perception of their own physical boundaries becomes blurred. Perhaps this was how life felt before the mirror stage? Haptic Field is a large-scale installation whose goal is to blur the relationship between different sensory modalities. The installation can be experienced by up to 18 people at a time, with each visitor wearing a garment that has up to 7 small wirelessly controlled vibrotactile actuators attached — these actuators produce patterns of vibration but also emit light. 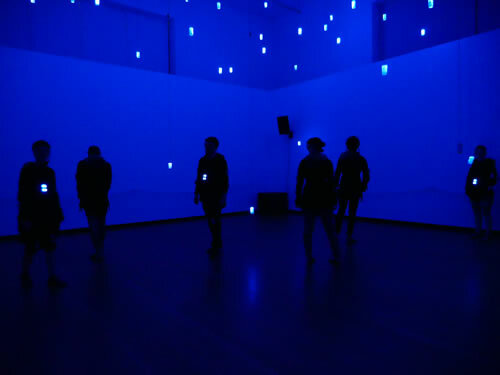 After donning a pair of frosted goggles that essentially blur the entire visual field and remove any sense of depth, the visitors then navigate individually through a series of rooms where extremely minimal light and sound are present. The light consists of small LEDs within acrylic tubes that are suspended in space at varying heights and change in intensity, brightness and colour. At a recent exhibition of the work at the Martin-Gropius-Bau in Berlin, the public moved through four different environments (although they were never sure how many actual spaces there were) that were equipped with varying amounts of light and sound and, hence, created different emotional states in the participants — feelings ranged from being overwhelmed to riding on the very threshold of perception. One space had only five lights hanging in a line that used thermal noise from their resistors to generate wildly varying intensities. These lights were synchronized with binaural sinusoidals at a very low level of amplitude. In another space, a large colour field present in the space was only visible when the visitors looked up toward the indeterminate height of the ceiling (in this room, almost seven metres). While we principally work with sight, sound and touch / haptics, these modalities are never isolated from each other in our experience. At the same time, the work demonstrates that the loss or diminishing of one sensory modality may, in fact, amplify and even influence other modalities. What is interesting about light in relationship to the visitors’ sense of diminished sight is that light is both contained (in the object in which the elements are placed) and also non-contained. Like sound, light spreads across the entirety of a given a space so that notions of boundary and position get blurred. Moreover, in Haptic Field, the light functions also in a temporal way — the manner in which the hanging lights change their pattern and rhythm aligns with both the projected sound and the resultant vibration on people’s bodies such that there is a kind of polytemporality going on across the different sensory modalities. In fact, as interviews at the different locations where the installation has been presented have informed us, many visitors confuse (or substitute) the light with the sound and vibration — the patterns they feel on their body seem to create a kind of cross-modal synesthesia (in the broad sense of the word and not its specific neurological use) between the different sensory elements. Again, Haptic Field proves (at least experientially) that we cannot isolate sense modalities. There is classic work in so-called multisensory integration studies on what Robert Warren and David Warren in 1980 called the “modality appropriateness hypothesis” of perception. This argues that the different sense organs give preference to the modality which is most appropriate at a given moment. So, for example, the eye is said to have better spatial resolution than the ear: if the eye is confronted by something unusual in the field of vision, it immediately starts scanning and trying to understand what it is seeing. The same with hearing — which, it is argued, has better temporal resolution than seeing. What happens in Haptic Field is that this “appropriateness” gets confused and mixed up precisely because the modalities themselves are fuzzy — at times, sound and light seem to have the same rhythm and pattern; at other times, they are not synchronous but one thinks they are because of the patterns of vibration we feel. Also, because the visitors’ sense of depth is so confused, they lose their ability to actually locate things (like the lights) in space — there is no way of knowing how far or close something is and, therefore, the sound might present a different sense of space than the eye does. All of this perceptual distortion adds up to a very strange and almost otherworldly experience. We are started to think about how we might design temporal gestures with light — the histories of light in the performing and visual arts have been overwhelmingly based on space. All of the theories of atmosphere are about boundaries, zones, shadows, direction, etc. But there is very little work to be found in the histories of light that regard it as something that, as Iannis Xenakis claimed, occupies time and creates rhythms. We only come to this thinking because we move between disciplines and genres. Lighting designers, for example, are not really versed in theories of temporal action emerging out of cognitive science or psychology — they’ve learned the craft of lighting design, which is about creating an environment with light that usually supports dramatic (or choreographic, in the case of dance) texts, and then choosing the appropriate instruments, positions, etc. to fulfil that goal. The minute you start to think of light as more closely related to sound in the sense of its temporal nature is the minute that you have to think beyond a single discipline. Presentation of Chris Salter’s multisensory installation Haptic Field (2016–17) in Immersion 2017 “Limits of Knowing”, produced by Berliner Festspiele at Martin-Gropius-Bau in Berlin (Germany) from 1–31 July 2017. YouTube video “Immersion 2017 Limits of Knowing Berliner Festspiele” (1:36) posted by “cs” on 19 July 2017. Video by Berlin Art Link for the Berliner Festspiele. Chris Salter is a Montréal-based artist, University Research Chair in New Media, Technology and the Senses at Concordia University, and Co-Director of the Hexagram network for Research-Creation in Media Arts, Design, Technology and Digital Culture. Salter’s performances, installations, research and publications have been presented at numerous festivals, exhibitions and conferences around the world. 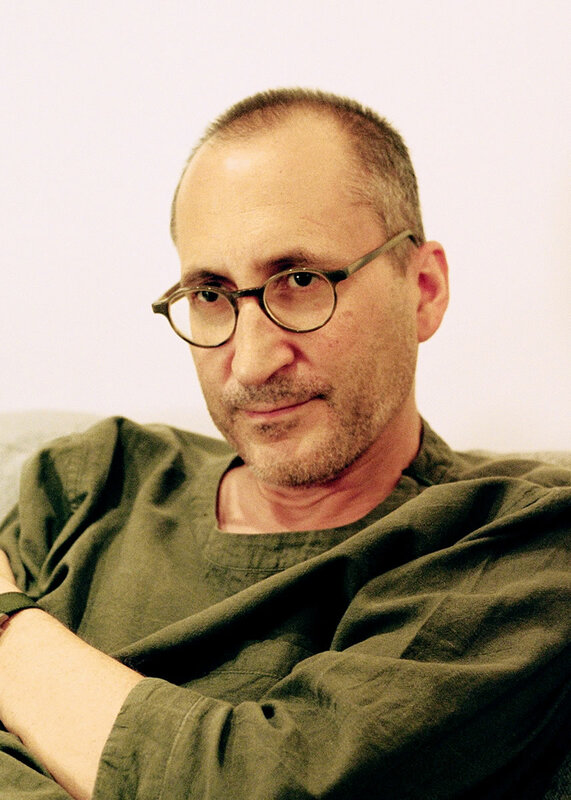 He is the author of Entangled: Technology and the transformation of performance (MIT Press, 2010) and Alien Agency: Experimental encounters with art in the making (MIT Press, 2015).